In my opinion, GetResponse handles all of these points well. So, in this review, I’ll quickly go over the main features of GetResponse, as well as my personal experiences with them over the years and what I’ve found.I’ve been a user of GetResponse for a few years now, and I’m still currently a happy client.However, it’s not an ideal solution for everybody, so hopefully this GetResponse review will help you to decide if it’s right for you. Who will benefit most from GetResponse? You’re new to email marketing, and want to get started in building a loyal list of subscribers who you can market to, and generate sustainable revenue through email for your growing business. You’re in affiliate marketing.Whether you’re just starting out or a seasoned campaigner, using an autoresponder that supports affiliate marketing is essential to your long-term success in this industry.While GetResponse is still an excellent choice even if you aren’t in the affiliate space, I personally use Aweber for the client side of my business. You can read my direct comparison of GetResponse and Aweber here. You’re looking for an efficient all-in-one solution that creates automated email campaigns, as well as providing a host of built-in tools like CRM and landing page creators. You want a reliable, cost-effective autoresponder either because you’re on a tight budget, or maybe you’d rather allocate any additional savings into more advertising. If you found yourself nodding your head in agreement to any of the above-mentioned points, then GetResponse will most likely be a good fit for you.However, let’s take a more detailed look. Starting with the pricing. Starting at just $15/month, GetResponse is one of the more affordable autoresponders available.For just an additional $34, you’ll get access to more powerful features like the CRM and webinar solutions. If you compare this with other vendors, you’ll realize the massive value you’re getting.Considering that we live in times where the saying ‘you get what you pay for’ often rings true. GetResponse goes against the grain by being one of the premium email marketing and automation providers, offering an extremely affordable service without compromising on quality. The fact that GetResponse remains one of the most popular autoresponders after so many years shows just how excellent their services are.Too often people are quick to jump on the bandwagon of newly released autoresponders promising the world with single digit pricing, unlimited subscribers and no mailing limits. This often ends badly as the new providers aren’t experienced in dealing with the influx of new clients, as well as the inevitable problems that arise in providing a consistent service.Cheap providers also tend to attract a lot of spammers and shady marketers whose actions tend to negatively affect the overall deliverability of the providers.Thankfully, GetResponse has been around for a long time and as a result, have their own systems in place to deal with these critical issues.However, it’s not just their track record of minimizing problems that makes them so popular. GetResponse provides a solid experience when it comes to their main features. The autoresponder is probably the main reason why you’re reading this review. It is after-all the reason why I subscribed to GetResponse in the first place all those years ago.Personally, I’ve enjoyed a very smooth experience with GetResponse’s autoresponder features. Everything from setting up a new campaign, to loading up new autoresponder messages at specific dates to be extremely straightforward, even for beginners. When I first started out with email marketing, I used GetResponse’s landing page creator all the time. As a beginner it was easy enough to get a landing page created for my campaigns. Although there were some frustrating bugs when trying to customize the page to my exact requirements.Since then, improvements have been made. You can select different pre-made templates according to your niche and type of landing page required, then simply customize it and you’re ready to go. You can also start from scratch if you prefer.However, as good as it is, I prefer to use either LeadPages or the Divi theme for my landing page creation. I just find them to be a smoother, easier way of building landing pages the exact way I want them to be.Overall, if you don’t have anything for creating landing pages, GetResponse’s landing page creator will suffice. However, tools and WP themes like Leadpages and Divi are in my opinion still superior for opt-in page creation. GetResponse’s workflows take email automation to the next level. Workflows are about refining your email campaigns by taking specific actions based on the individual interactions of each of your subscribers. Allowing for more targeted messages which will result in higher conversions. I’ve played around with them a little and found it quite easy to setup my first workflow as there’s an interactive tutorial you can follow to get them setup.However, I can’t comment too much on them since I’m not currently using workflows in my business. Although I plan to implement them soon.You can see GetResponse’s Workflows in greater detail here. GetResponse’s webinar solutions is not something I currently use, and most likely something I’ll never use. Having said that, the few people I’ve spoken to that do use it, have no complaints so far. However, it’s not something that I can comment on. So, if webinars are your thing, I suggest you try it out for yourself. As mentioned earlier, I almost exclusively use GetResponse for its autoresponder, and not for its other well-known features like the webinar solutions and landing page creator.Overall, I’ve found GetResponse very easy to use. When I was still new to email marketing, and just starting out with setting up my first campaign in GetResponse, I remember it being a straightforward and simple process.The dashboard is clear and easy to navigate and with the introduction of a new and improved UI, you can customize widgets that display on the main screen so that you can quickly assess how your campaigns are doing.And speaking of campaigns… The campaign setup is a breeze. And, once you get used to the navigation, you’ll find that you’re able to create new campaigns in just a few minutes. Loading in autoresponder emails is also very clear. All you need to do is choose the day in the calendar when you want to schedule a specific mail, confirm the time, write the email and then you’re good to go. GetResponse does a better job than most other autoresponders with the email creationSome of the other autoresponders that I still use, as well as some others that I’ve tested, don’t have an option (or a clear option that I could find) to shorten the width of the emails. With GetResponse, you just adjust the numbers as shown in the below images.And why would you want to do this? Well, I’m no expert, but in my opinion, it makes your emails appear shorter and easier to read. And from my testing, I’ve gotten better engagement from it, so I try to do it all the time now. Another handy feature is the built-in Spam Score testing when you’re creating your emails. This lets you quickly check the likelihood of your emails ending up in your subscribers’ spam folders.The only thing worse than hitting the spam folder is for your emails not to be sent out at all. Which brings me to the next point. Deliverability. Niche: Health and Fitness (Weight-Loss)Source: Bing AdsTraffic: UntargetedAverage industry open-rates: 22.03%Average industry click-through rate (links clicked in email): 2.69% As you can see, from this quick test I was able to get 50% open rates which is over double the industry average. Now, I didn’t get any clicks, but that is because of the emails being badly written. Niche: Home and Garden (Parenting)Source: Bing AdsTraffic: UntargetedAverage industry open-rates: 23.83%Average industry click-through rate (links clicked in email): 3.59% From this test I had even better open-rates at 58.33%. Again, over double the industry average and with some link clicks as well.This is great.If there was poor deliverability I’d hardly get any emails being opened because they wouldn’t be landing in the recipients’ inbox. And, being able to test new affiliate verticals knowing that your emails will get delivered is already half the battle won.And while we’re on the topic of affiliate marketing. GetResponse is by far the most affiliate-friendly autoresponder out there. They integrate with major affiliate networks like JVZoo to make your campaign setup even easier. And, you can sleep easier at night knowing that your account won’t be shut down for running affiliate promotions. A problem many have faced with some of the other autoresponders. From a pricing standpoint, GetResponse is 100% the most cost-effective autoresponder that I use.And, if you’re looking for more advanced features like CRM and ecommerce solutions you should start with their Pro plan and get a FREE Email Marketing Certification course through this link. 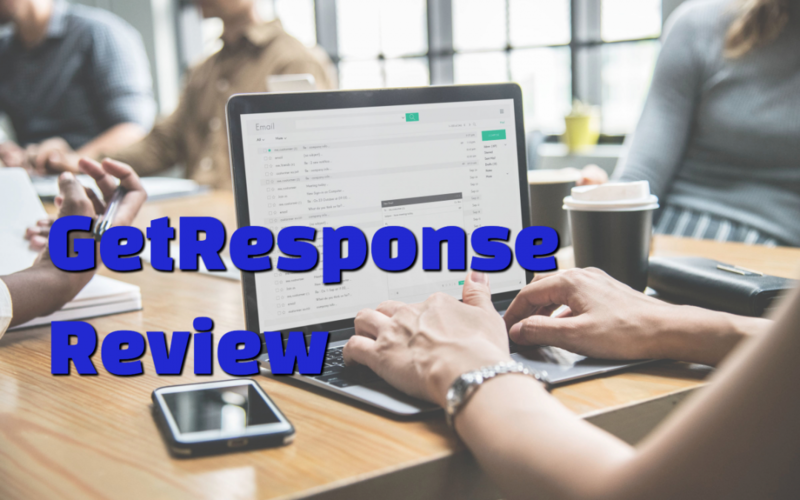 GetResponse is hands-down my favorite autoresponder for affiliate campaigns.Although I’m using Aweber for the client side of my business, I’m seriously considering moving that to GetResponse as well. Not because there’s anything wrong with Aweber.However, the constant improvements and new features being introduced to GetResponse, as well as the excellent deliverability and ease of use makes it very appealing.With GetResponse you can expect a solid service.Knowing that your autoresponder will work as it’s expected which will allow you to focus on sending traffic and tweaking your offers.It’s very easy to pick up as a beginner, and if you are an experienced email marketer, you’ll enjoy being able to use advanced features like the CRM without needing additional tools.I hope that you’ve found this GetResponse review helpful. You can try them out free for 30 days here.